The loss of more than one hundred hairs every day over time or the development of individual bald areas is called male pattern hair loss. The reason for this may be due to illness, but the usual reason is hereditary hair loss. Bald spots do not occur from one day to the other, and only become visible when there is reduced growth and shrinkage of the hair shaft. The hair starts to have a shorter life span; it grows thinner, shorter and falls out earlier. This process is known as miniaturisation. The most common reason for hair loss is based on the inherited sensitivity to the hormone dihydrotestosterone (DHT), this weakens the hair and shortens the growth phase of the hair. Dihydrotestosterone is significantly involved in the loss of hair, but it is not only the cause of hair loss. 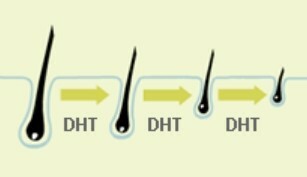 Hair loss occurs when genetically sensitive follicles respond to dihydrotestosterone. Hair loss is genetically pre-programmed but does not affect all the hair follicles over the head, the hair follicles that are not affected are those around the sides and back of the head. This means that even with cases of advanced hair loss a ring of hair remains. 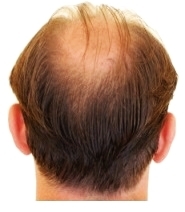 This band of hair is an important prerequisite for a hair transplant. It is possible to remove a hair follicle from the genetically strong area and it retains the genetic information and continues to grow in the area of hair loss. Read here what miniaturisation means and how it occurs.